Last Thursday, November 15, learner groups presented their final recommendations to the leadership of Pinewood Forest. The event was completely learner-led and open to the public. 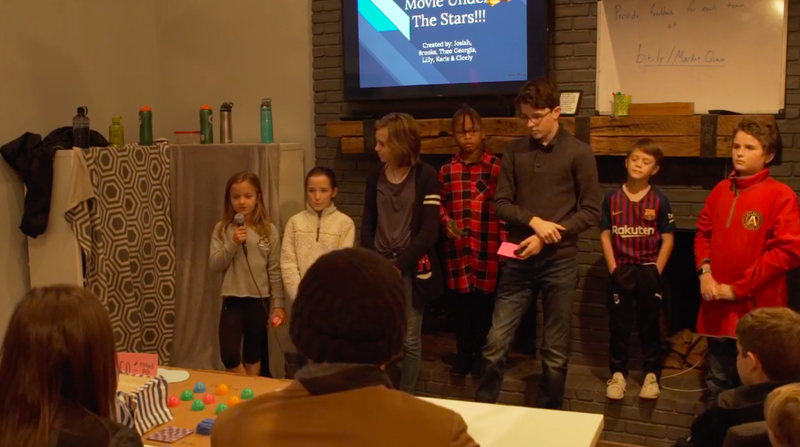 We were pleased to welcome multiple visitors, as there were opportunities both to see learner presentations, to see learner reflections, and to speak with the co-founders, Tyler and Joy. Thursday night's Exhibition can be watched on Facebook Live here. Thanks to our hero Wyatt for helping with set up. Which would you rather have—awesome skills, a fixed mindset, and a sub-par attitude OR a growth mindset, good attitude, and skills with room for improvement? When questioned about how he chooses players for his team, renowned head women’s basketball coach at UCONN said he would rather lose a game than play an athlete with poor sportsmanship. Remarkably, this is coming from a coach whose team hasn’t lost a game in almost three years. With each passing season, Coach Ariemma says players like this are getting harder and harder to find. The Forest School’s main objective isn’t to cultivate the next round of college athletic recruits; but we are fostering an environment that not only accepts but seeks robust feedback and coaching. The public Exhibition you witnessed this week was but a snapshot of revision-feedback-application cycle that was applied continuously for weeks. And while we consider their efforts successful, Friday was focused on reflection and goal setting for next session. Continuous improvement. Growth mindset. Unanimously the Elementary heroes decided great skills are worthless without a growth mindset and good sportsmanship. As we cultivate and nurture the heroes' ability to process and apply feedback, we also continue our journey of allowing growing pains to strengthen our confidence and resolve. And to keep the learning going. What does the last week of the session look like? You're likely to see a marked increase in focus during Core Skills as Heroes aim to hit their session goals in math, reading, and storytelling. That focus will last until Thursday, when the nerves for that night's exhibition will distract learners from their e-learning platforms and cause them to double and triple check their presentations for the evening. Frustrations that come with group work will inevitably reach a boiling point in the home stretch. Team work is tested. The pressure is real. Focus returns in the hours leading up to the exhibition. Heroes sweep, mop, move furniture, arrange chairs, and help setup camera equipment for the live stream. The Exhibition itself is a blur of nervous energy, as Heroes put in front of the public eye weeks worth of work. On Friday, focus (and relief) returns to the studio as Heroes finish up their badge work and reflect over the session: how did they grow as individuals, as Quest teams, and as a studio? And, after that, the Heroes rest.